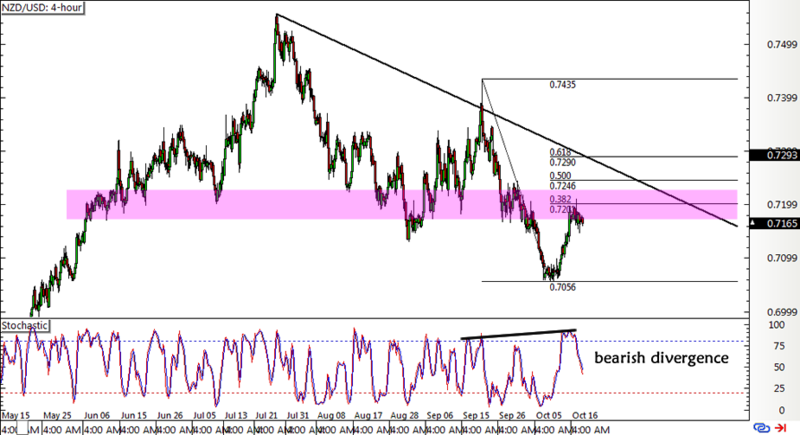 I’ve still got a bearish Kiwi bias and I’m seeing this neat pullback setup on NZD/USD. Think this one could play out better than my other NZD short idea? This pair recently broke through the neckline of its head and shoulders reversal formation on the 4-hour time frame, signaling that a downtrend is in the works. I’m seeing a descending trend line that could connect the latest highs of price action, but it looks like price is already finding resistance at the broken neckline around .7200. This lines up with the 38.2% Fibonacci retracement level while the trend line is closer to the 61.8% Fib and .7300 handle. To top it all off, I’m also spotting a bearish divergence as stochastic made higher highs while the pair had lower highs since mid-September. The oscillator is already moving south, so the area of interest might be enough to keep gains in check. Earlier today, New Zealand had its Global Dairy Trade auction and saw back-to-back declines in dairy prices. This might prompt Fonterra to downgrade milk payout forecasts later on, which would mean downside pressure on revenues and price levels. In contrast, the U.S. dollar is regaining support from speculations that Trump could appoint a less dovish Fed head. Data from Uncle Sam has also been mostly better than expected this week while a couple of FOMC voting members talked about their openness for a December hike. I haven’t set any orders yet since I’m still on the fence about waiting for a larger correction to the .7250-.7300 area. FOMC members Dudley and Kaplan are still scheduled to give speeches later today, so additional volatility could be in the cards. Do you guys think I should short at market or wait for better entry points?